This week myself and Jonathan Mansfield, Landscape Painter give an insight into their working practices towards a curated show at The Pound Arts Centre, Corsham. I want to be a blacksmith! Modern blacksmiths are fantastic, they are multi-skilled and multi-talented, they often work alone through choice and because it is a hard to generate enough work to run a team and if you are restricted by your workshop space. There is a growing interest in our craft through modern media highlighting specific aspects according to what is fashionable at the moment. This could be the moment for blade making as promoted by TV shows like Forged In Steel and the likes of Game Of Thrones/Lord Of The Rings. A new breed of blacksmiths are emerging, some through the great colleges and courses in blacksmithing that we have in Hereford, Warwick and Dorset, some through the need to leave city jobs and make a new life with a new craft skill. I welcome these blacksmiths with open arms – we need more blacksmiths! The UK has some great blacksmiths but it doesn’t incorporate their ironwork into its built environment as much as other European countries do. There are many more blacksmiths in Europe because the architecture there lends itself to the use of decorative ironwork as integral features rather than add-ons. All this is good if you have an interest in blacksmithing, you are probably already aware of the pieces blacksmiths have made that are around you, this might be what has inspired you to become a blacksmith! Where do you start if you want to be a blacksmith? Do some art and/or Design Technology and/or engineering at school or as an evening class or hobby if you have left school – it will help – you do need to be able to represent a line in metal in some way on a board or piece of paper. This is the starting point of anything you will make even if it is a straight line like on a blade – you need to know the tang shape and section style! Go and see blacksmiths working at local county shows like Bath and West, Yorkshire Show, New Forest Show, Royal Welsh, Edenbridge and Oxted. There are blacksmithing (and sometimes farriery) competitions and live forging displays that you can watch and meet the blacksmiths there. You can also participate in the competitions when you are ready! Do a one day course with a blacksmith to see if you like it, it might not be the romantic ideal it is often perceived to be! It is hot, noisy, dirty and hard work even though it is also fun and fantastic to make an actual thing with your hands at the end of the day! Visit your local forge and ask if you can firstly watch the blacksmith, see what is involved and see if you think you will like it then, if they are the right person, ask if they need some help. Are you strong and fit? Have you any experience in a workshop? Can you weld? What type of welding? A lot of blacksmiths work alone and like it that way, don’t be put off just because the first one you approach doesn’t want to share their space and time with you 24/7! Business skills will be essential. You need to be able to run your business and do most of these things yourself or earn enough money to pay someone else to do them for you. Computer skills suitable for running your business - like Word and Excel for quotes and invoices. Photogaphy – you need to keep a portfolio of images of work you have made that shows it to its best. These are all things you can learn if you don’t know them when you start. If you can do a welding course DO IT! Learn to use a MIG, TIG and ARC and GAS weld at your local agricultural/technical college. This is a really important skill for a modern blacksmith. What kind of blacksmith do you want to be? Do you want to be a general blacksmith doing all sorts of work from forging and fabricating metal items for homes and gardens, taking what ever come in and you can do. Lots of blacksmiths start this way and specialise later as they find their niche in the market. Do you want to make the same things that have been designed and made by others before you or do you want to make all new designs of you own? What do you want to specialise in? You could have an interest in tools for other crafts makers, blades or scissors; stone, leather and glass workers all need tools. Are you into blade making? This is a specialist field with a growing interest and market. Do you want to make re-enactment and TV/film quality work? Do you like archaeology? You could make reproduction work for museums and collectors and combine your hobbies? 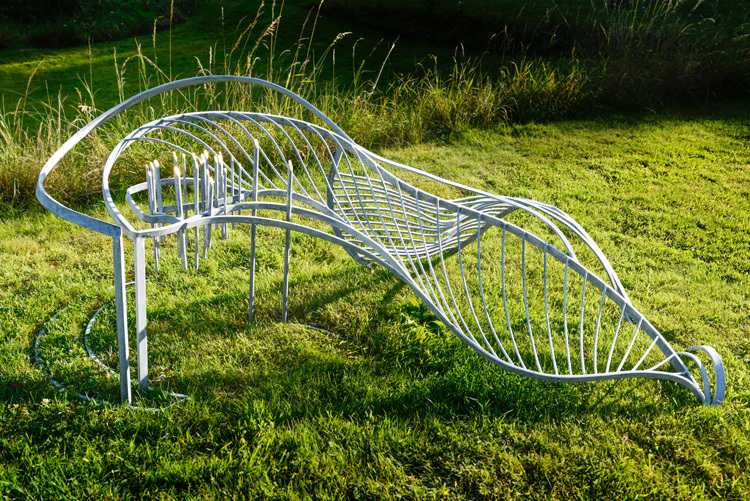 Do you want to make sculptural work to sell through galleries? Do you want to work with architects and town planners and shape the look of our streets and townscapes? Are you interested in gardening and want to specialize in works for gardens and outside spaces. Develop links with garden designers and garden centres. Most blacksmiths are commissioned to make bespoke work – this means it is designed to fit a specific space and do a specific job. To do this you need to negotiate with lots of different people from clients to planning officers, council development officers, architects, structural engineers, landscape designers, builders, galvanizers and paint specialists and more! You need to know when building regulations apply to the work you do and provide health and safety information, paint finish information and guarantees when asked. Many larger commissions run over the allotted time frame, this can throw out the rest of your working schedule and upset other clients that are waiting for you to make their product. Managing this aspect of your work will be one of the hardest things and takes great skill and management. You won’t always get it right but you will only be as good as your reputation. There is still a lot of word of mouth recommendation within the blacksmithing world. A lot of blacksmiths will have a ‘bread and butter’ thing that they do to keep the wolf from the door. It might be a small repeat item that they make and sell online or at shows or it might be a big item that they repeat make that has lower overheads than one off commissioned work. This is a good business model, the item might change over the years but it is a good thing to have to fall back on should commissioned work dry up, run over time or fall through. Good luck for your future blacksmithing adventure – let me know if this has been useful! For anyone that has followed the progress of my sculptural work, there are developments afoot. 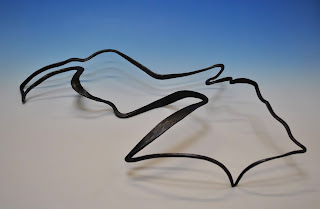 The Landscape NH series of modular sculptures are based on familiar landscapes around Puthall Farm, towards Axford, Ramsbury and Mildenhall which I have walked, cycled and ridden for the last fifteen years. The shapes and formations of the landscape and field boundaries; marks made by man on the land, have informed the lines and contours of the works as I have remembered them from repetitive journeys. Familiar motifs of woodland peaks catching the sun, holloways and chalk pits are all represented in these works which are reflections on a journey across a remembered space. 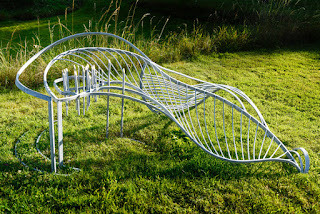 The Lifeline sculptures started from a point of recognition of the historical and archeological features that surround Marlborough, Wiltshire. The nails mark those specific points of a journey on a to-scale map. This was the beginning of the journeys and landscapes work and is for me, a significant and important move towards a new subject and style. 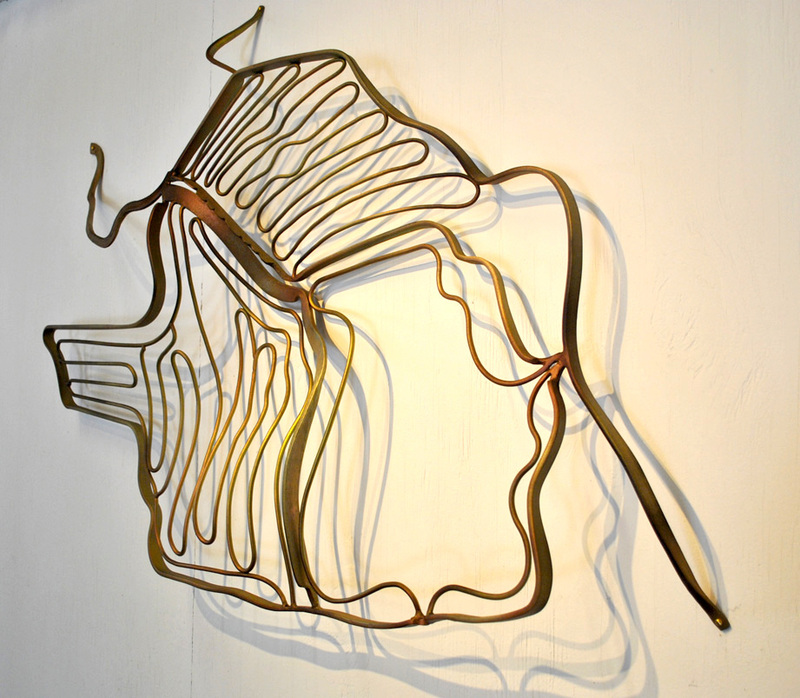 The new work, Lifeline Part 2A and 2B are drawings in forged steel of a part of the journey to my new home in the Pewsey Vale. Repetition of a journey is backed up by sketching and photography enabling me to capture the essence of the space in which I am physically moving. These pieces are made with the height of the hills to scale and may be recognizable to some who are familiar with that landscape. The making process of the Lifeline works is integral to the work. Hot-forged lines, worked in three dimensions with changing sections of steel give the sensation of the movement through the landscape. The way in which hedges squeeze us tight and landscape features and immovable boundaries make us move or make our eye follow a path. The delicate and spindly nature of the new work is intentional, it reminds me of the fragility of the world we live in. The Journey pieces follow the paths and routes that I take regularly on foot, bike or horseback and are often circuitous. The process of forging the route allows me to get the sensation of moving though the landscape. These works are also to scale and made from remembered motion. 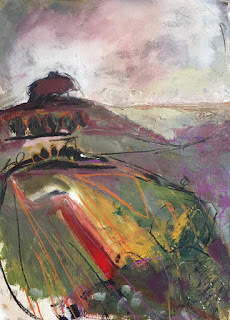 While we have fantastic mapping and visual technological aids to help us map our progress though the landscape, I find that it is my physical journey that best informs my work so rely on my memory of a journey to make these works. 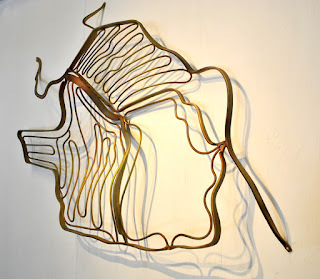 The way in which I work is following a formula of drawing and measuring, forging then forming. The title numbers are a reference to the circumference of the work and each one is unique, a rarity it seems in the sculpture world of editions. 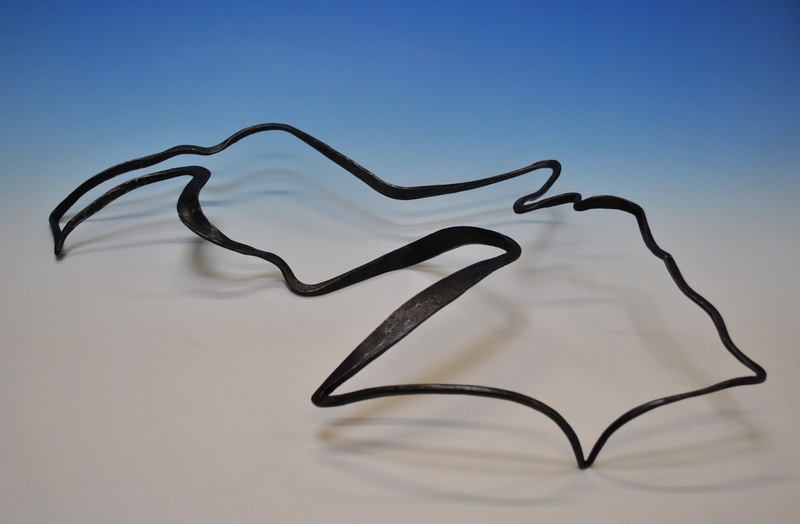 I am looking forward to finding a client who wants to commission me to make their landscape in either the forged variation of Lifeline or formed like the larger Landscape pieces. If you would like to discuss this option please get in touch with me. I am fortunate enough to live and travel across the most stunning landscape so close to my home, I want to say look at this natural resource all around us – don’t look through little screens and camera viewers – look, feel and sense the shapes, lines, places, paths, don’t take it for granted, it is so special.